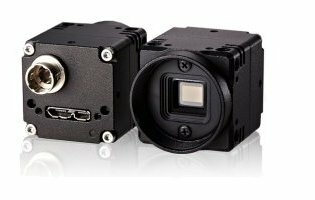 The MBCM200U3V is 2 Megapixel B&W (2048 x 1088) USB3 Vision compliant camera with a 2/3″ CMOSIS Sensor capable of frame rates up to 167 Hz. It has a compact rugged design measuring 28mm (W) x 28mm (H) x 40mm (D). SenTech GigE Vision cameras feature Pleora drive hardware providing compatibility with a wide variety of software applications. Windows and Linux drivers and SDK are available in the document section below. 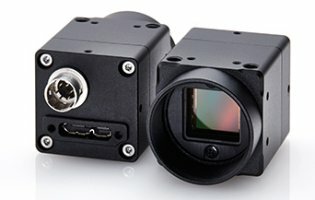 The MBCM200U3V-IR is 2 Megapixel Near Infrared (2048 x 1088) USB3 Vision compliant camera with a 2/3″ CMOSIS Sensor capable of frame rates up to 167 Hz. It has a compact rugged design measuring 28mm (W) x 28mm (H) x 40mm (D). SenTech GigE Vision cameras feature Pleora drive hardware providing compatibility with a wide variety of software applications. Windows and Linux drivers and SDK are available in the document section below. The CMB4MPOE is 4 Megapixel B&W (2048 x 2048) Gige Vision compliant camera with a 1″ CMOSIS Sensor capable of frame rates up to 25 Hz. It has a compact rugged design measuring 28mm (W) x 28mm (H) x 40mm (D). SenTech GigE Vision cameras feature Pleora drive hardware providing compatibility with a wide variety of software applications. Windows and Linux drivers and SDK are available in the document section below. The MBCM401UV3 is 4 Megapixel B&W (2048 x 2048) USB3 Vision compliant camera with a 1″ CMOSIS Sensor capable of frame rates up to 89 Hz. It has a compact rugged design measuring 28mm (W) x 28mm (H) x 40mm (D). SenTech USB3 Vision cameras feature Pleora drive hardware providing compatibility with a wide variety of software applications. Windows and Linux drivers and SDK are available in the document section below. The MCCM401U3V is 4 Megapixel Color (2048 x 2048) USB3 Vision compliant camera with a 1″ CMOSIS Sensor capable of frame rates up to 89 Hz. It has a compact rugged design measuring 28mm (W) x 28mm (H) x 40mm (D). SenTech USB3 Vision cameras feature Pleora drive hardware providing compatibility with a wide variety of software applications. Windows and Linux drivers and SDK are available in the document section below. The STC-MCA5MUSB3 USB 3.0 color camera features a 1/2.5″ CMOS Aptina sensor with a scalable 5MP (14fps) to 32 x 32 pixels (2,106fps) resolution. This low cost, high performance camera is compatible with all standard industry drivers, and comes with the Sentech Viewing Software and SDK.